QRD – What was your first guitar & what happened to it? QRD – What’s your typical set-up from guitar to effects to amplifier? QRD – What’s the most important part of your rig – guitar, amplifier, or effects? Dave – Definitely the guitar. QRD – What’s your main amplifier & why? Dave – I have always really enjoyed my Roland VGA-7. The modeling options are great, & do not have to be too colored necessarily. & the 13-pin input options are very interesting to me, & can be blended with the straight guitar input. QRD – What’s your main guitar & what are the features that make it such? Dave – US Masters Vector Versatek - this guitar is amazing, & perfect for me. US Masters makes very high quality guitars with standard features that fit my natural preferences. The neck joint is unbelievably solid, the tone control is more useful through the full range of the knob than any other guitar I have ever played, the Sperzel locking tuners & the Dunlop 6105 frets are favorites of mine. 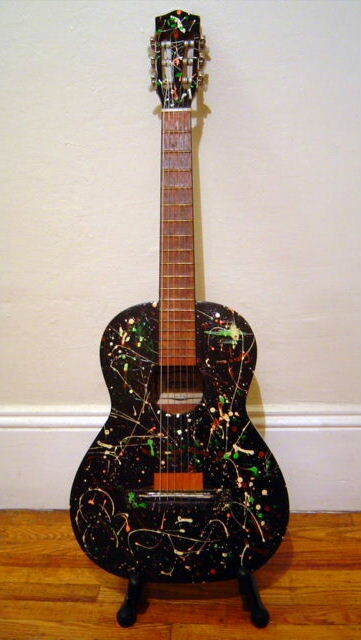 QRD – If you had a signature guitar, what would it look like & what would some of its features be? Dave – Shape-wise, I’m not sure. It would have a stop tailpiece, many pickup/coil-tap configurations, a rosewood fingerboard, a transparent finish. QRD – If you had a signature pedal, what would it be & what would some of its features be? Dave – It would be some sort of strange morphing modulation/delay pedal with a lot of real-time parameter control. QRD – How many guitars do you own? QRD – How & where do you store your guitars? Dave – In their cases, most in my studio, a couple in storage. QRD – What do you wish guitar cases had that they usually don’t? Dave – Maybe a little music box that plays something pretty when you open it. QRD – What features do you look for when buying a guitar? Dave – Generally: playability, tone, stability, speed, comfort, unless I am looking for something more specific. QRD – How much do you think a good guitar should cost? Dave – That completely depends on what you are getting & what good means to you. QRD – Do you upgrade & customize your guitars or just stick with what you get? Dave – I almost always upgrade &/or customize. QRD – How thoroughly do you research or test a piece of equipment before buying it? QRD – Do you change your rig around often? Dave – I think it is in a constant state of evolution on some level, however slow that might be. If I find something I really like, I am able to stay with it for a long time. QRD – Are you after one particular guitar tone & locking into it, or do you like to change your tone around a lot? Dave – I like to have several basic solid tones that consistently express my playing well. & a million others for specific purposes. QRD – What are some guitars, amps, & pedals you particularly lust after? Dave – I’m curious about the Eventide pedals, & it would be nice to have a roomful of strange old amps. QRD – What do you think are some important features to be on a person’s first guitar that aren’t always there? Dave – 1. playable, low action, 2. good intonation, 3. reasonable tone. QRD – What have been the best & worst guitar related purchases you’ve made? 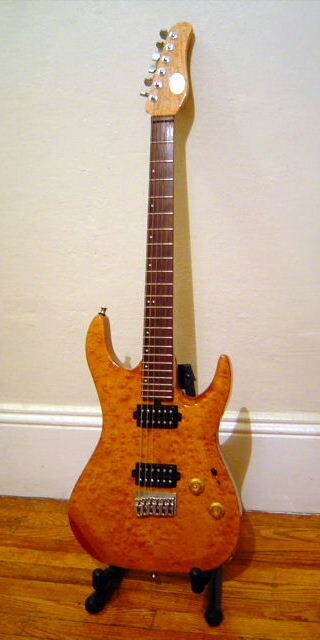 Dave – Best: US Masters Vector Versatek guitar. Worst: not to name names, a low-cost tube preamp. QRD – What are some effect, amp, & guitar brands you particularly like or dis-like & why? Dave – I have had a lot of Roland/Boss equipment over the years, & I have loved it. & their customer service has always been A+ for me. QRD – What’s the first thing you play when you pick up a guitar? Dave – Usually some sort of wide interval exercise. QRD – How old were you when you started playing guitar? QRD – At what age do you think you leveled up to your best guitar playing? Dave – I’m still improving, I hope. But I think I made a big jump in my early 30s when I committed to practicing 5 hours per day. I did that for several years, before I owned any recording equipment. Once I started recording a lot, I suddenly had less time for practicing the guitar, but I felt like I was at a point on the guitar where my time was often better spent recording than practicing hour after hour. QRD – Why do you think a guitar fits you more so than other instruments? Dave – The range of tones & the different ways of using it (rhythm, percussion, melody, texture, etc.). QRD – Do you think guitar should be people’s first instrument as often as it is? Dave – I don’t know. It is more convenient than a piano in most ways, although the piano may be a better first instrument sometimes. QRD – Do you see your guitar as your ally or adversary in making music? Dave – Always an ally. QRD – Who are the guitarists that most influenced your playing & sound? Dave – Al DiMeola, Wes Montgomery, Eric Johnson, Joe Pass, George Lynch, Randy Rhoads, David Torn. 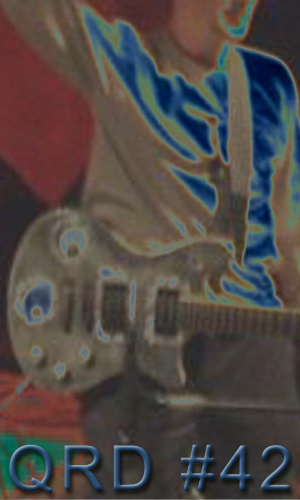 QRD – Do you think people anthropomorphizing their guitars is natural or silly (e.g. naming their guitar)? Dave – It is silly, often totally contrived & pretentious, but somewhat natural in a way if you spend so much intimate time with an instrument. I also suppose if you have enough guitars, it is a more romantic way of distinguishing them than by model number. QRD – What’s the most physical damage you’ve done to a guitar & how did you do it? Dave – Extremely retuning my 1/4 size acoustic until the bridge became unglued & popped off. QRD – What do you do to practice other than simply playing? Dave – Studying chords & melodies, critical listening, developing tones & sounds. QRD – How many hours a week do you play guitar & how many hours would you like to? Dave – Usually about 10 hours per week, ideally more like 15-20. QRD – What type of pick do you use & why? Dave – After years of using more standard-sized picks, a few years ago I switched to Dunlop Pitch Black Jazz III picks (1.14mm). They have so much more control. Now playing with a standard-sized pick is like playing with a dinner plate. I also sometimes use a Dunlop Ultex Jazz III for a little different response, & a Dunlop Nylon Jazz III XL when I need more of a surface & more of a point. QRD – What gauge strings do you use & why? Dave – It depends, but mostly D’Addario XL120+ (.0095, .0115, .016, .024, .034, .044). The feel of that gauge is just right for me. For my playing, sometimes the .009 is a little light & the .010 is a little stiff. I use the more common .009 set on some guitars. I also use Thomastik-Infeld Rope Core strings on several guitars, & a really heavy gauge on one guitar. QRD – How often do you change strings? Dave – That depends on usage, generally every 3 weeks to 3 months. QRD – How often do you break strings? QRD – Which do you feel is more proficient, your strumming hand or fretting hand & how does that effect your style? Dave – I think my left hand is a little ahead of my right hand, after years of developing a more legato style. But I have come to realize the importance of developing the picking hand fully, as it is the activating hand which accounts for most of your tone & definition. QRD – Do you set-up your guitar yourself or send it to a guitar tech (or not set it up at all) & why? Dave – I use a guitar tech because he is a million times more knowledgeable about such things. QRD – What tunings do you use & why? Dave – Standard tuning, Drop D, Drop A, & a few I have developed myself. QRD – Do you prefer tablature, sheet music, or some other notation system for writing down your own ideas? Dave – I usually record my ideas with notes, but if I had to jot something down quickly I would use tablature. QRD – How high do you hold your guitar when playing (strap length)? Dave – I don’t know exactly - not high, not low. QRD – What’s a bad habit in your playing you wish you could break? 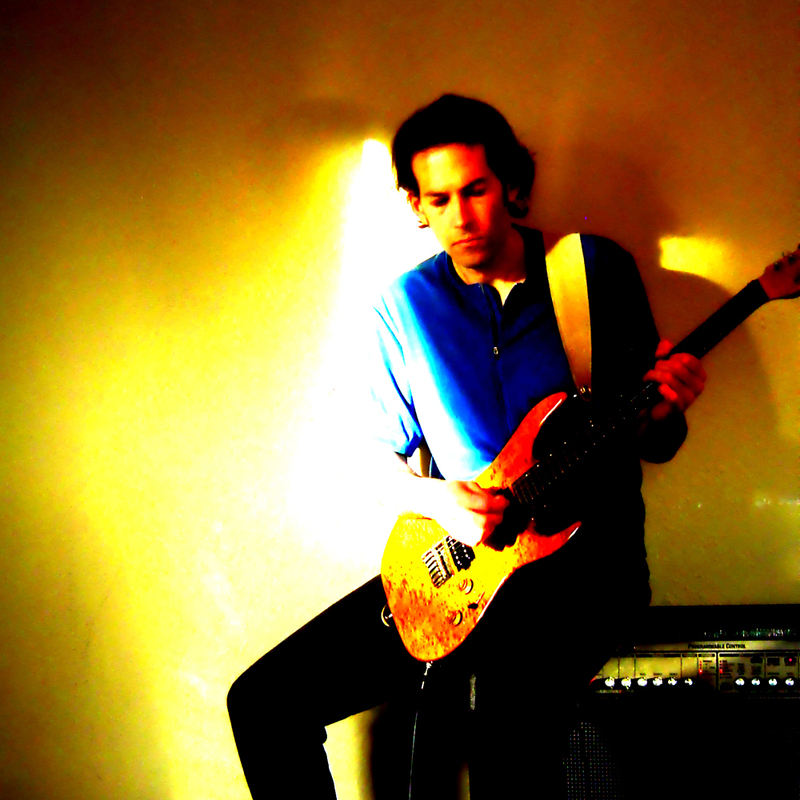 Dave – Having limited patience to play difficult parts very slowly in order to learn them. QRD – Playing what other instrument do you think can most help someone’s guitar playing? QRD – What’s a type of guitar playing you wish you could do that you can’t? QRD – What’s a guitar goal you’ve never accomplished? Dave – I would like to be able to build a guitar. QRD – What’s the last guitar trick you learned? Dave – I’m not sure - probably one of the weird signal-processing things I stumble upon frequently. QRD – What’s your favorite guitar gadget (ebow, capo, slide, string cutter, etc)? Dave – I have always been very fond of the ebow. QRD – What’s a guitar technique you’d like to master, but haven’t? Dave – 10-finger tapping? No, just kidding. Some of the classical technique would be good to have a better grasp of. QRD – Did you ever take guitar lessons & if so, what did you learn from them? Dave – Yes, for 3 years when I started playing. I learned a lot of general stuff of course, & a lot about discipline in practicing. QRD – What would you teach someone in a guitar lesson that you don’t think they would generally get from a guitar teacher? Dave – I try to bring my own interpretation of music theory & as many outside approaches as reasonably possible, with improvisational practice, & a tie-in to something basic that a student can generally relate to. QRD – What’s something someone would have to do to emulate your style? Dave – Technically, maybe adopt a legato playing style with some interesting string bends & some palm-muting. QRD – What’s your take on tremolo systems? Dave – I generally do not care for them or need them. QRD – How often do you adjust your tone knob? Dave – Once I have it set, I usually don’t adjust it while playing. But I use several different settings. QRD – What do you see as the difference between lead guitar & rhythm guitar players? Dave – Someone who is a “lead guitar player” makes me wonder if he is rhythmically challenged & not capable of playing solid rhythm guitar. Whereas someone who is a “rhythm guitar player” may be a more well-rounded player even if he lacks the confidence or desire to play lead guitar. QRD – If a band has good guitar work, can you ignore the rest of the band not being good? QRD – What famous musician’s guitar would you like to own & why? Dave – Maybe some really weird Rick Nielsen guitar because I would enjoy being a collector of strange guitars. QRD – Who do you think is currently the most innovative guitar player & why? Dave – I like Vernon Reid & David Torn a lot because they have a really unique outside perspective & are so textural in their guitar playing, almost transcending rhythm & melody/harmony. QRD – Where can people hear your best guitar work? 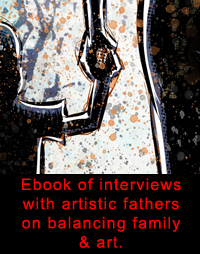 Dave – There are links to my recordings at www.davehalverson.com. Of my recordings, the most guitar-intensive are Apothecary Charms (2008), The Colours of Darkness (Trance Lucid, 2005), & 1991 (recorded in 1991, released in 2009).